It’s hard to argue against an organization winning three championships in five years being called a dynasty. This is exactly what Maya Moore and the Minnesota Lynx have done. 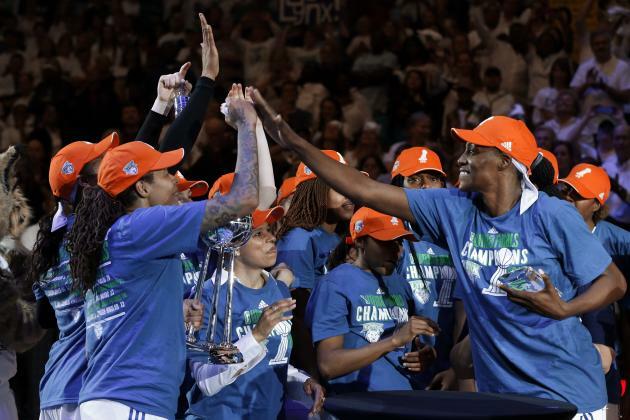 They are your 2015 WNBA champions. In what was up until game five an exciting series against the Indiana Fever ended with the number 1 seed in the west dominating in all aspects of the game. Indiana was finally able to slow down Maya Moore holding her to just five points on 1-8 shooting but it wasn’t the legend in the making that sealed this game. It was a midseason acquisition by the name of Sylvia Fowles who was fittingly named finals MVP who held down the fort during this game. Fowles finished the game with 20 points and 11 rebounds and most definitely the defining moment of her decorated career. The Indiana fever seemed to have just run out of gas. After taking game one of the finals in Minnesota we knew this would be a remarkable series in the making. Losing a hard fought game two and a backbreaking buzzer beater in game 3 many may have thought the the Lynx would be raising a trophy in downtown Indianapolis. But if you have Tamika Catchings on your team you can never be counted out. The Fever fought tooth and nail and forced a game five back in Minnesota but here was the end of their amazing season under the guidance of first year head coach Stephanie White. Catchings left it all on the floor with a double double of 18 points and 11 rebounds but didn’t get much help from anyone else. Shenise Johnson, who had a great finals chipped in 10 points and 5 rebounds but that wasn’t enough to stop a determined and talented Minnesota Lynx.